Pollinators is an interactive sound installation aimed at increasing public awareness of pollinators' decline. 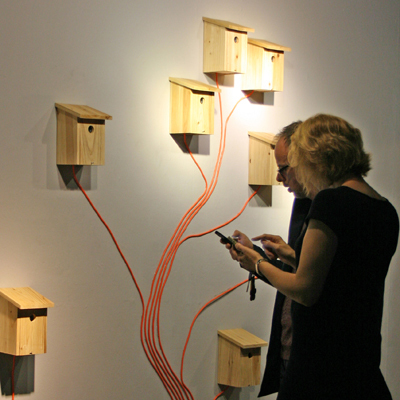 Ten interactive birdhouses attached to tree branches made of electric cables are "nesting" different birds; visitors are invited to trigger their calls using a smart phone or tablet. The wooden birdhouses incorporate speakers and amplifiers; the control system includes an Arduino, a Rasperry Pi as a DHCP and Web server, a wireless access point, and bespoke software to allow real-time interactions. This installation reminds us that nature needs our help and invites people to take simple, practical actions to reverse this negative trend. Visitors use mobile devices to trigger the calls of "nesting" birds.